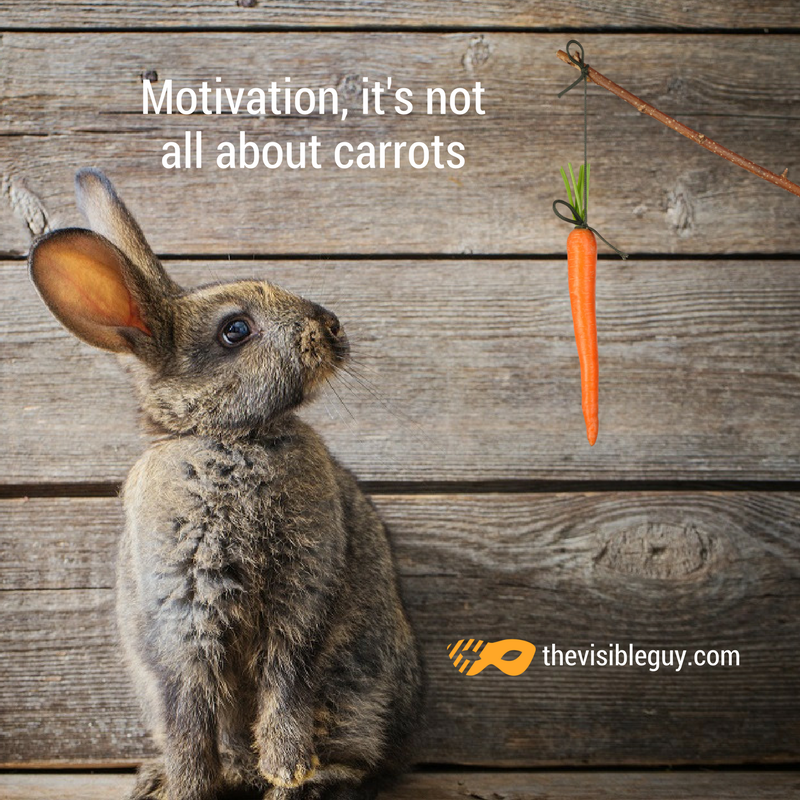 We have likely all heard of the ‘carrot and stick’ idiom that uses either rewards or sufferance to elicit the right behavior. Two things repel me when I hear this. A stick to induce good behavior – no thank you. I also do not like carrots. I really cannot understand why today we are still working with the ‘carrot and stick’ mentality. Whatever the rationale is for using this approach, there are fundamental errors at play that first need to be highlighted. ASSUMPTION 1 – UNWELCOME BEHAVIOUR IS A PROBLEM MANAGEMENT NEEDS TO SOLVE. If we suddenly changed paths and look at any unwelcome behaviour, the obstacle, as an opportunity as opposed to a problem, then the scenario changes completely. Take, for example, a racing driver who is yet to win a race. Do you tell the driver that they must go faster and cut corners otherwise they will continue to lose races and be dropped from the team? Or do you ask the driver what could make them push the car a bit more so they can safely overtake the car in front and win? An approach that could elicit solutions not yet dreamed of. ASSUMPTION 2 – MOTIVATION MUST BE PROVIDED BY MANAGEMENT. The ‘carrot and stick’ idiom works on the theory that responsibility for motivation sits firmly with management i.e. the manager must motivate their employees. This may have worked well in the industrial revolution when typical tasks were more routine, unchallenged and highly monitored. Today jobs are more complex requiring problem-solving, lateral thinking and self-drive. Motivation has shifted from being influenced by external factors to the intrinsic. I do not believe that the majority of human’s lack of drive or commitment. I believe that they are often an untapped source of passion that in turn will drive their motivation to succeed. Contemplate what you are most enthusiastic about in your own life – there will be motivation and purpose behind it. You may not even count the hours or effort involved because you are so passionate about the purpose, your values simply align, and the outcomes provide a sense of real accomplishment. If an organisation could unlock the self-motivation within their workforce the outcomes could be remarkable. ASSUMPTION 3 – RECTIFYING FACTORS THAT DEMOTIVATE WILL IN TURN MOTIVATE. There is a presumption that what may demotivate is intrinsically linked to what motivates – i.e. fix the demotivation factors and the employee will, in turn, be motivated. This is not necessarily the case. Consider an employee who is demotivated due to an uncomfortable work environment or perceived lack of pay. Fix these elements and the employee may still not be enticed to perform better. Their perception could just be that a ‘wrong’ has been righted; there is no motivation to change their own behaviours. At school, there was only one way to learn English. It did not motivate me because my dyslexia went unnoticed and it made lessons difficult. I remember my school report stating, ‘could do better, is disruptive’. The message and outcomes were simple. If I did not improve I would be sent to the back of the class or dropped a year. The two key issues were that firstly the school had failed to identify what the underlying obstacle was. Secondly, the carrot just did not register with me. I just do not like carrots. I had no internal motivation to be good at English, it was not something I was passionate about. Step 1: Do not simply reach out and ask why someone always seems to have a lack of interest, as apathy may just be the outcome, not the actual root problem. Step 2: Find out what uniquely drives each individual. What obstacles are appearing? What would the journey look like if the obstacles were removed? Step 3: What does their passion look like? How have past experiences led to the present? How can you bring back their passion today? Are you ready for some honest soul-searching? Assisting others to unblock their motivation is the yin. To lock in the yang, ask yourself the above same questions. Why? When leaders say, they have unmotivated staff, rarely do the leaders acknowledge that they could be the cause (or part) of the blocking. To truly be motivated the individual needs a leader who will be complementary, interconnected, and interdependent. Understanding the motivations of individuals allow them to commit to tasks (accountability), driving results, often via new creative initiatives, whilst keeping the focus on the ultimately aligned goals. Once the motivation that drives a person is understood, the stick is no longer required because an individual’s will and passion are the key drivers that the individual needs. A reward may still have its place in some circumstances, as long as it does not dampen creativity or curb performance. It must also be linked to an individual’s own motivations e.g. to save for a holiday. Yet recognize that it may not look like a carrot. It can be an apple or anything else – as long as it is something that actually matters to them, not what a leader perceives will matter based on their own motivational drivers. Many organisations only have carrots – one way does not fit all. There are no excuses. We have systems today that can manage as many carrots, apples etc as we desire… a whole fruit bowl if needed. Whilst we may expect workers to conform to one way of doing things, we cannot ask them to confirm to one type of reward without the inherent risk of demotivating some of them. The additional cost of administrating a fruit bowl will be minor in comparison to the lost productivity. There are many paths we can take to complete the journey and reach the same ideal destination. Regardless of whether it’s apples or carrots, understanding what motivates individuals and acting accordingly will have favorable outcomes. Take the first steps down this motivational path today. Gordon Jenkins, The Visible Guy™, is the straight-talking international authority on Growth and Networking. He is an accomplished entrepreneur, professional speaker, mentor, coach, motivator and advisor. He is the international author of Network with Purpose – Transform your skills in 4 simple steps. His ability to connect with diverse groups of people is compelling. The Visible Guy has spent over 25 years enabling others to navigate, commit to and action change. He supports and guides his audiences through the growth maze, encouraging self-driven accountability and celebrating success. The Visible Guy is living proof that no matter what the challenge, you can transform the situation and position yourself for success. The biggest cap on your growth is you.